Amid rumours that Portugal will follow the Greek example and will request a second bailout, the European Commission`s report on the third review of the Portuguese adjustment programme is impressive. And the differences with Greece are more than obvious. 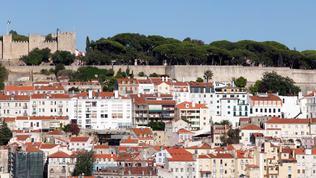 It is not that Portugal is flourishing or that it does not face serious risks. But, as the deputy mission chief for Portugal, Peter Weiss, explained, Portugal`s compliance with the programme is extremely good - 110 out of 120 measures envisaged for this stage of the programme have been met or nearly met. And only for 2011-2012 the country will achieve fiscal consolidation amounting to 7%, which Peter Weiss defined as "enormous." "The fiscal adjustment in 2011-2012 is remarkable by any standards," the report itself does not spare praises. Starting from a deficit of 9.1% of GDP in 2010, in 2011 the country has over-fulfilled the target to reduce the deficit to 5.9% by reducing it to 4%. Part of the success is due to the transfer of bank pension funds, amounting to nearly 6 billion euros, to the state budget. For comparison, Hungary used similar tactics to fill the budget gap in, but as no steps for long-term budget stability and structural reforms have been undertaken, as early as 2013 the budget will again fall out of balance. Although admitting that the Commission did not like one-off measures, Peter Weiss explained why in the case of Portugal they are acceptable. On the one hand, the country had less than a year to meet the programme targets - Portugal received a bailout loan in May 2011. On the other hand, the government has achieved a further deficit reduction by 3.5%. 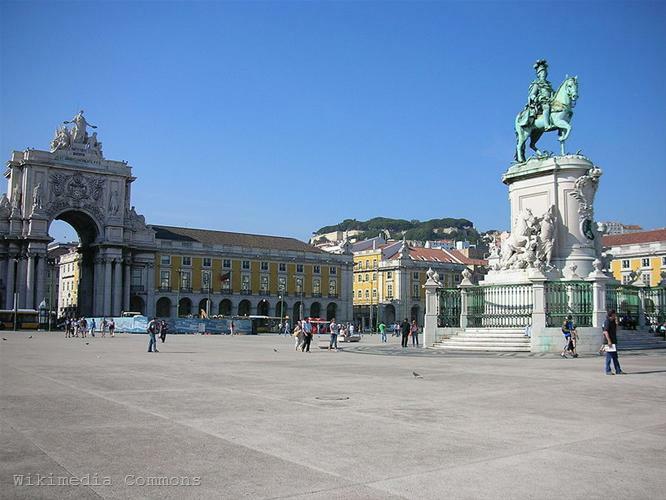 In 2012 the Portuguese Government intends to consolidate what has already been achieved last year and to offset the effects of the one-off measures by keeping the deficit at 4%. According to the Commission, Portugal has a good base to fulfil its commitment to bring the deficit below 3% of GDP by 2013. 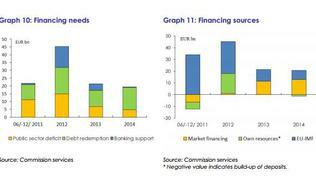 The 2012 budget envisages consolidation measures amounting to 5.4% of GDP. Cost reduction will come mostly from cutting the 13th and 14th wage in public sector, as well as pensions, Peter Weiss said. Important steps have also been taken to control costs and increase efficiency of the health care system. Like Greece, budgetary control at the local level remains challenging. On the revenue side, the report notes that in less than a year Portugal has significantly improved its tax policy, which has significantly contributed to the budget consolidation (another difference with Greece). From a system with a relatively narrow tax base and higher rates the country has moved towards a broader basis, focusing on taxes considered less detrimental to growth (VAT and excise duties). At the same time, the possibilities for tax credits and exemptions have been significantly reduced. As the tax burden on the population increases significantly in 2012 and 2013, the government has adopted a number of measures to prevent tax evasion. 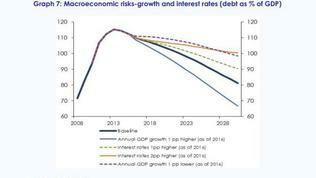 According to the report, Portugal`s public debt will peak at 115% of GDP in 2013 and then will start declining. The turning point is to achieve a primary surplus (before debt service) of over 2% of GDP by 2014, combined with a modest GDP growth. 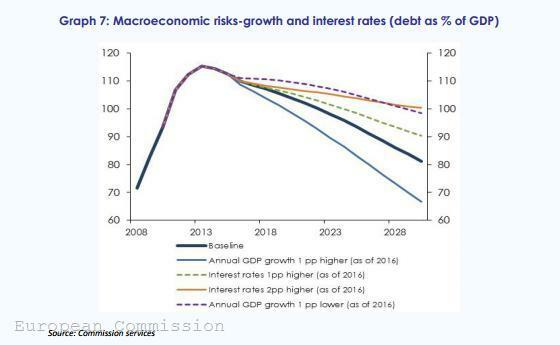 Portugal could bring down its debt well below 100% of GDP by 2020, provided that economic growth does not fall below the projected 2%, the debt interest rates do not exceed 5% and the cost of ageing (the cost of pensions and health care) does not increase significantly. 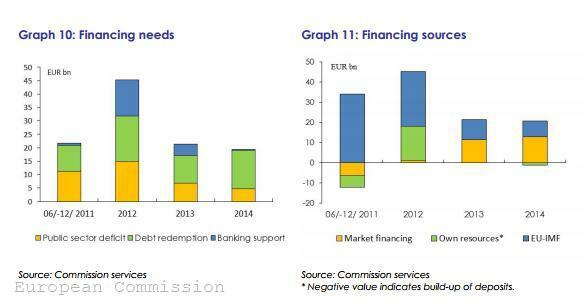 Again, unlike Greece, the country is doing very well with privatisation, the report states. The 5 billion euro target for privatisation revenue is likely to be exceeded, as only the sale of state shares in the energy company and the energy network company has brought revenue of 3.3 billion euros. The privatisation agenda for 2012 includes selling the national air carrier (TAP), the airport operator Aeroportos de Portugal (ANA), the cargo handling subsidiary of the railway company, the postal service Correios de Portugal etc. Portugal urgently needs to restructure its state enterprises, since their large debts are a potential threat to the state budget. Special attention should be paid to the network industries, particularly the energy sector, to reduce its growing debt, the report notes. Major reforms are needed in terms of services and regulated profession, although even in these areas "significant progress" is reported. The report stresses that the government has reached an agreement with social partners on labour market reforms, going beyond the requirements of the programme. According to the Commission, particular attention should be paid to the duration of unemployment benefits and mechanisms for collective bargaining, especially given the evidence of increased unemployment. The report stresses that reforms of labour, product and services markets are crucial to unleash the economy's growth potential. As Peter Weiss explained, if structural reforms are carried out successfully it would add another 1% per year to the economic growth. In the long run (10-15 years), the Commission forecasts that the Portuguese economy will grow by about 2%. It is foreseen positive growth to be achieved for the first time in 2013, but in 2012 the GDP is expected to decrease by 3.3% (only the forecast for Greece is worse, projecting a decrease of -4.4%). The Commission was surprised by the data showing a rapid increase of unemployment, Peter Weiss said, but it was not yet aware of the reasons and needs to analyse the numbers. Asked about the risks of a worsening of the situation in Spain, he replied that he did not expect any dramatic developments in this regard. Spain remains the largest trading partner of Portugal (a quarter of Portuguese exports goes to Spain) and will continue to be an important factor for economic developments in the country. Peter Weiss noted that there were first signs of return of market confidence in Portugal, because the yields on Portuguese debt had started to decline, although remaining generally high. According to the report, these high levels are due to “market speculations about a second adjustment programme containing private sector involvement” (debt restructuring). Peter Weiss did not comment on whether the country would be ready to return to markets in the autumn of 2013, when it has to buy back debt worth 10 billion euros. However, he expressed confidence that if the Portuguese government continued to implement the programme as it had done so far, it would not need to resort to a second bailout. Another important difference with Greece is that, according to Peter Weiss, there is broad political support and consensus on the programme in Portugal. 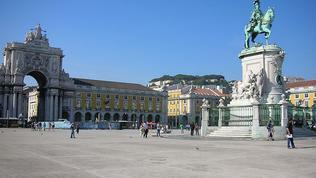 "The Portuguese government remains committed to the implementation of the adjustment programme. Legislation passes smoothly through the Parliament, and the main opposition party continues to support the Programme targets. Despite the often difficult measures and rising unemployment associated with the crisis, social cohesion in Portugal so far appears to hold," the report states. There was a similar conclusion in the fifth review of the implementation of the Irish bailout programme, which clearly shows the importance of political will and public support for carrying out difficult reforms. And that lesson is valid not only for countries under bailout programmes, but for all others, who still believe that the task of politicians is to postpone unpopular decisions from one election to another just to satisfy the voters. Based on the report the European Commission is ready to grant Portugal the fourth tranche of 15 billion euros of the bailout loan totalling 78 billion euros.